Hello! In the last day or two I have decided to go on a road trip this week with my kids, so no menu from me this week. I haven’t the faintest idea what we’ll be eating for dinner let alone anything else the next 7 days as we galavant across the Old West! I am certain that some of you will have your menus planned, which the rest of us will need desperately since I’m coming up short with inspiration. 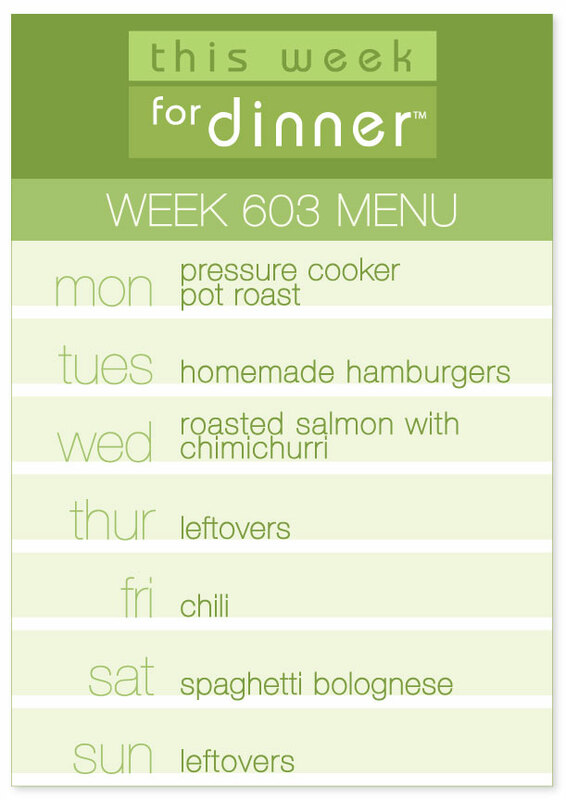 So, this week more than ever, please post your wonderful meal plans in the comments below! And now I must go pack the car. Those words have come out of my 7-year-old’s mouth no less than 1,000 times over the last week. 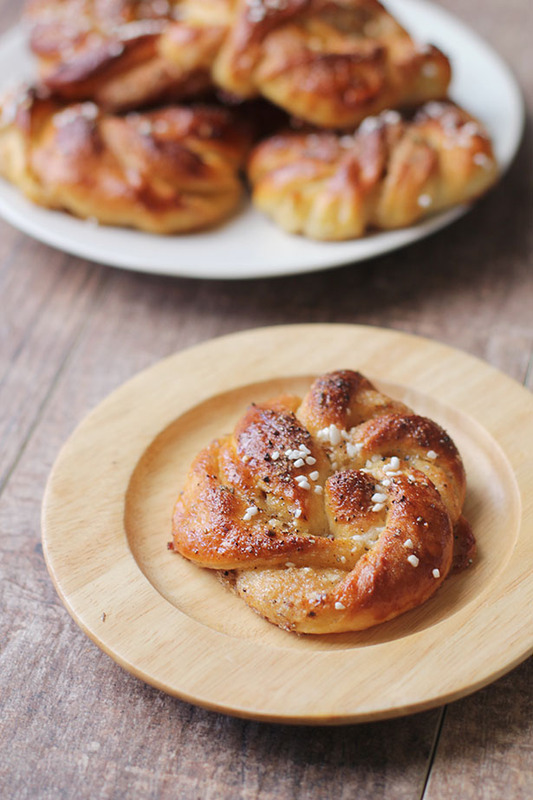 Bulle is our family’s word for Swedish cardamom bread, whether in bun or braided loaf form. Bulle technically means “bun” in Swedish, so the cardamom version is actually called kardemummabullar (bullar is sort of like the plural version of the word for bulle…my dad explained it to me and it was weird Swedish grammar stuff that I cannot re-explain, so we’ll just leave it at that). 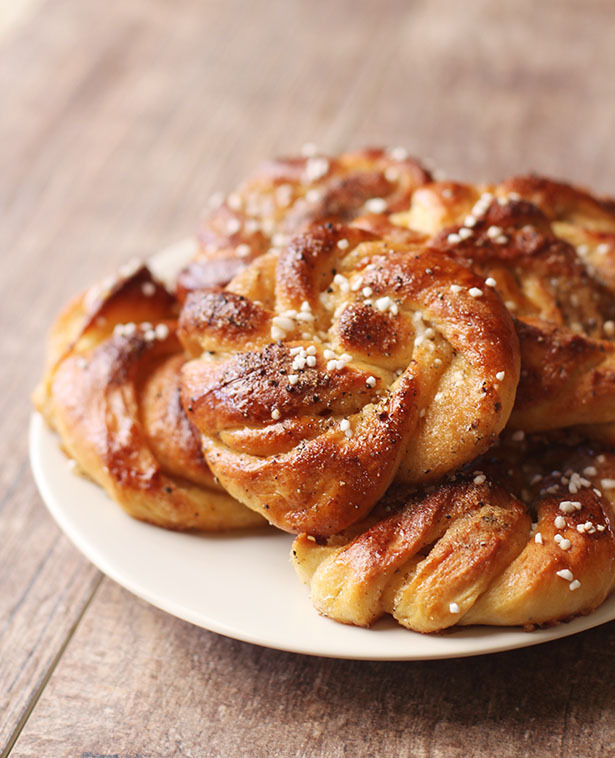 I’ve had the recipe for vetebröd (braided Swedish sweet bread, in our case flavored with cardamom) on my site for years. I even shared a bun version of that recipe, the way my grandmother always made it. 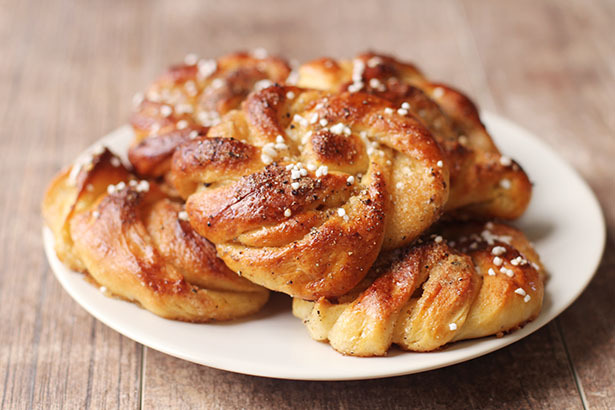 When Nate and I went to Sweden with my family this summer we had kardemummabullar like we’ve never made it here at home. Obviously the first thing we did when we were all together post-trip was try to replicate that Swedish goodness. My sister-in-law Cora and I took a first crack, then she and my mom have since perfected the recipe and technique. Cora graciously wrote a post and recipe for us, which I am sharing below. 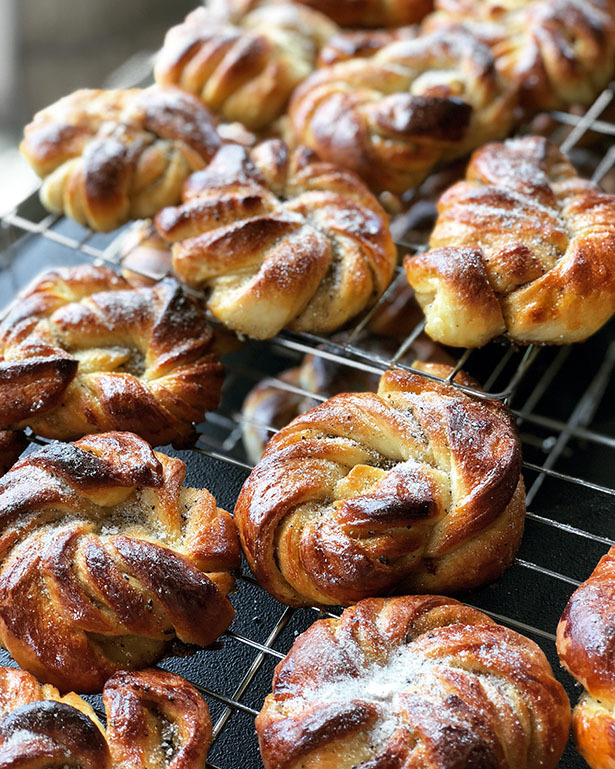 These cardamom buns are magic. Sorry, wait. That’s supposed to come at the end, isn’t it? But seriously… you’re going to be so grateful to me. I accept flowers, love notes or life-sized Chris Hemsworth cardboard cutouts. Jane has my details. Let me start off by saying I am not Swedish. When Christian (Jane’s brother) and I first started dating, I knew my husband’s family was Swedish but mostly only on the holidays. Christian told me fabled tales of Christmastime and, in particular, the Christmas Eve feast: breaded Swedish ham, savory meatballs, pickled herring and sugary bullar. Turns out he was mostly right about the deliciousness, just exclude the fish. His mother is basically Mrs. Claus. Her home becomes utterly transformed at Christmas. Her presents are decorated so beautifully she uses them for decorations on high shelves and in her windows. The candles, the non-creepy Santa collection, the music and the tree with 15 strands of lights make it all feel like Christmas might actually be hugging you. Then she starts to cook. Lawd, the food. I eat, roll over for a nap, eat some more and only then do I leave the table. It’s goooood, people. After everyone’s rib cages are finally able to expand again, she gives one final gift. She makes bullar. And this is now my gift to you fine folk. We went to Sweden last summer and ate bullar at every stop, from gas station to coffee shop. I kid you not. Then Jane and I came home and started tweaking the old family recipe. We did a damn fine job, if I do say so myself. 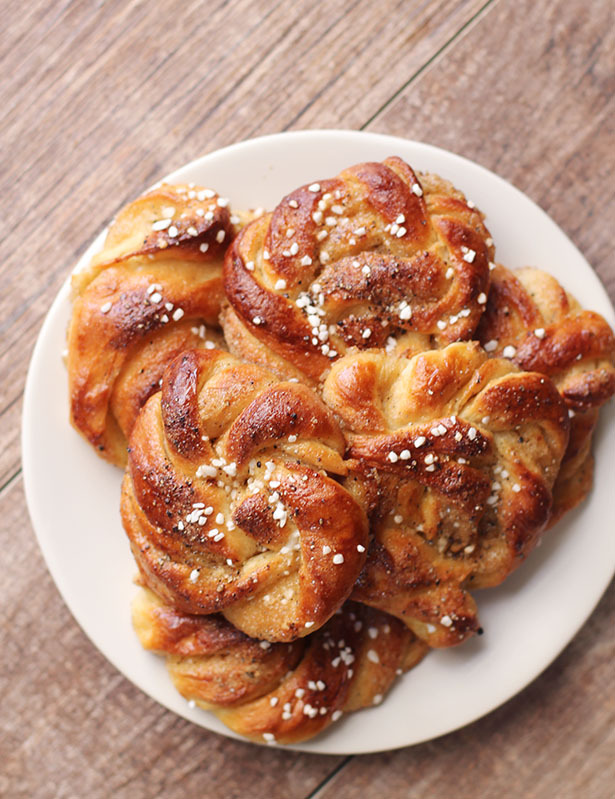 Of all the authentic sampled kardemummabullar, I can think of only one small shop in the-middle-of-nowhere-Sweden whose bullar outdoes what we made. So it may seem like a lot of steps but stay with me. It’s worth it. Please do try to wait until they’ve cooled some before eating three (or more) right off the cookie sheet. Taste buds grow back but it does take time. Presenting…Phyllis, Jane, Cora and Some Old Swedish Broad’s Cardamom Buns! Turn dough unto to lightly floured surface. Roll into a large rectangle. Spread evenly with filling and fold dough in half. Cut 1-1½ inch strips of dough with pizza cutter. 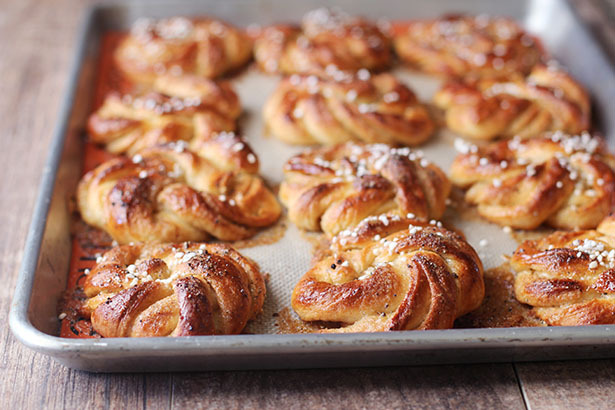 FORMING THE KNOTTED BUNS: Now it's time to form the beautiful, awesome-looking buns. This part is tricky. There are lots of ways to do this. Jane does it differently than Phyllis and I remain as neutral as Sweden conforming to whatever method takes my fancy. There are links below this recipe so you can watch videos of people shaping the rolls. Definitely go watch those videos! You will essentially twist the strips and tie a knot. They’re supposed to be rustic, so don’t stress if they don’t all look the same. They will all still be beautiful. One strip at a time, gently hold one end of dough with one hand while the other twists the dough until it stops, making a spiral. Be careful not to break the dough. Now wrap dough around two fingers once or twice depending on the length of the strip and tuck ends into the center of dough. Phyllis tucks one end in the top and one end in the bottom. Jane holds the bottom end while wrapping around her fingers and uses the other end to go over the center of the top before tucking into the center of the bottom. See, confusing! Watch the videos they’ll help. Place rolls on un-greased, parchment-lined or Silpat-lined cookie sheets. Let rise until double, 30 to 40 minutes. Preheat oven to 400º F.
While buns rise a final time, make simple syrup. In a medium saucepan combine sugar and water. Bring to a gentle boil and allow to cool. When buns are double in size, gently brush with the egg wash. Bake in oven 14–16 minutes, rotating the pan halfway through. When buns are done the tops and bottoms should be a dark brown. The bottoms are your key to doneness, so be sure to lift one before you take them out and make sure it's dark brown. Immediately brush hot buns with simple syrup and sprinkle with sugar cardamom topping or pearl sugar. Happy Holidays! Merry Early Christmas! I just finished grocery shopping. I think we can huddle in for the next few days with no need to go anywhere. I am really looking forward to quiet time with our kids! 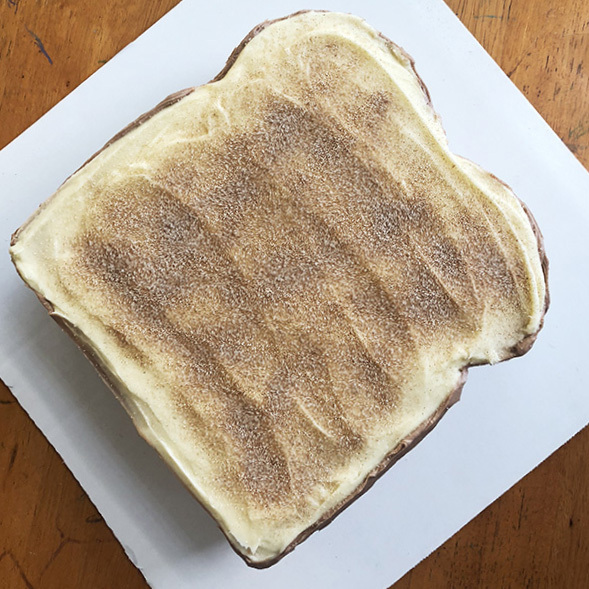 How to Make a Cake That Looks Like Toast. Yep, Toast. My oldest child Cate turned 14 a few days ago. (PS: FOURTEEN. Unreal.) Cate is obsessed with toast, so much so that I’ve instituted a toast ration in our house. Yeah, I know, meanest mom ever. But this ration is there to protect all of us – it keeps Cate from dying of malnutrition from overindulgence of toast and also saves me from spending my entire retirement on good toast bread to support her habit. (I think drugs might be cheaper, quite frankly. Not that I’m condoning drugs or anything but seriously I SPEND SO MUCH MONEY ON BREAD, PEOPLE.) 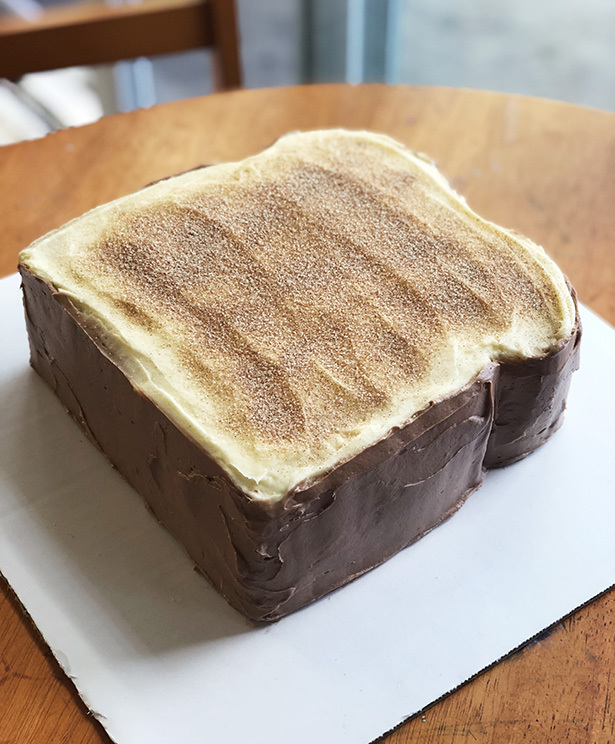 As her birthday party was approaching this year she came up with a brilliant/hilarious/bizarre birthday cake request: toast. 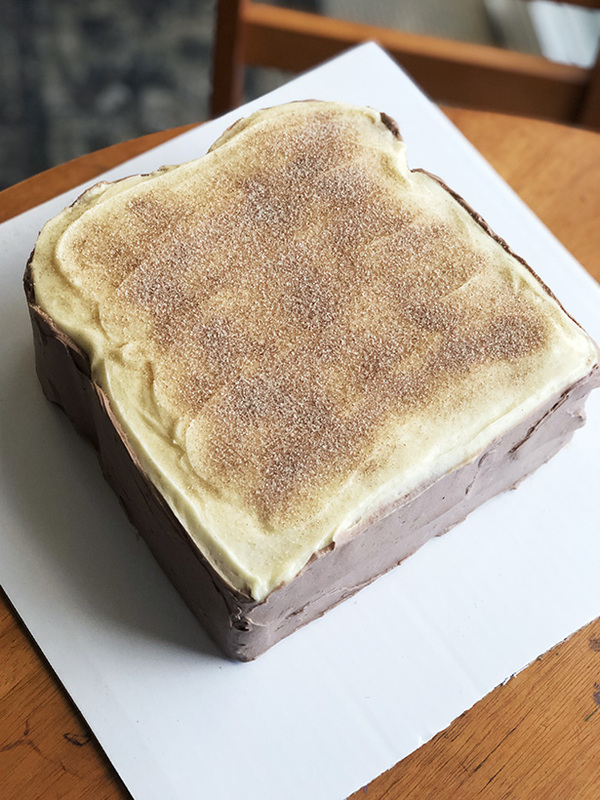 Yes, she wanted a cake that looked like toast. Honestly, I wasn’t opposed because I figured it couldn’t be too hard to figure out how to make a cake that looks like toast. I was right. A toast cake is not hard at all. And the cake ended up being so fun the photo I posted on Instagram got the most likes of any photo I’ve ever posted there. Who could have predicted a cake that looks like toast would be so popular, even among non addicts? Since the cake was such a hit, figured I’d give you all a quick rundown on how to pull it together. In addition to a quick step-by-step, I’ll share the recipes I used. Bake two 8- or 9-inch square cakes. I made vanilla cake with cream cheese frosting because those flavors go great with cinnamon sugar. 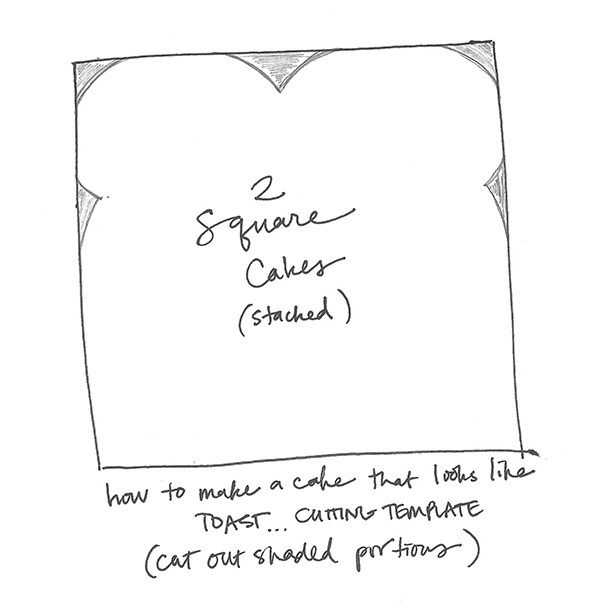 Stack the unfrosted cakes on top of each other and then cut out pieces as indicated in the drawing below. Frost the cake like you would any 2-layer cake but leave the sides unfrosted. I made a back and forth motion on the top in parallel lines so the frosting would look like butter was spread on the cake. Once the middle and top of the cake are frosted, sift a bit of cocoa powder into the frosting and blend well. You want to make a nice light brown-colored frosting. I probably added about a tablespoon or so. Use this to frost the sides of the cake. Once the cake is frosted, sprinkle the top carefully and evenly with cinnamon sugar. Be sure to click here and read through my Amateur’s Guide to Making Super Cute Cakes post. That post has all the tips you need to successfully decorate the cake! That’s it! If you can make a 2-layer cake, you can make a toast cake. This frosting is perfect for decorating cakes and cupcakes! Beat the butter and cream cheese with a hand mixer or in a stand mixer until smooth. Add powdered sugar and beat on low speed until combined, then on high speed until frosting is smooth. UPDATE 12/18/18: This past week included two of my kids’ birthdays and my busiest work week of the year. As I add this update to this post it’s 5:00 pm and I still don’t know what’s for dinner! 😉 SOOO…please share your menus for the week of 12/18 in the comments below! A few of you already have and I love those people oh so very much. Have a great week! 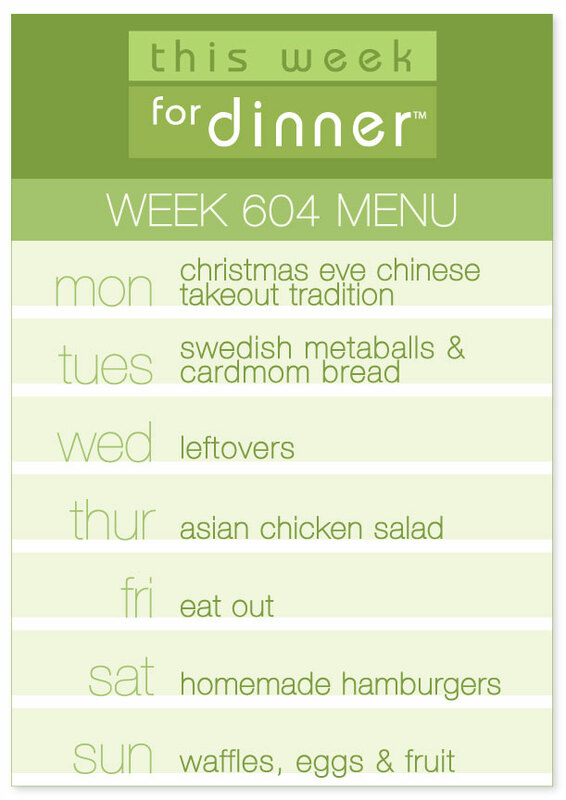 I have a few carryover items from last week’s menu, which means no grocery shopping until later in the week, woohoo! You know the drill…share those weekly meal plans in the comments below! And have a great week! Hello friends! 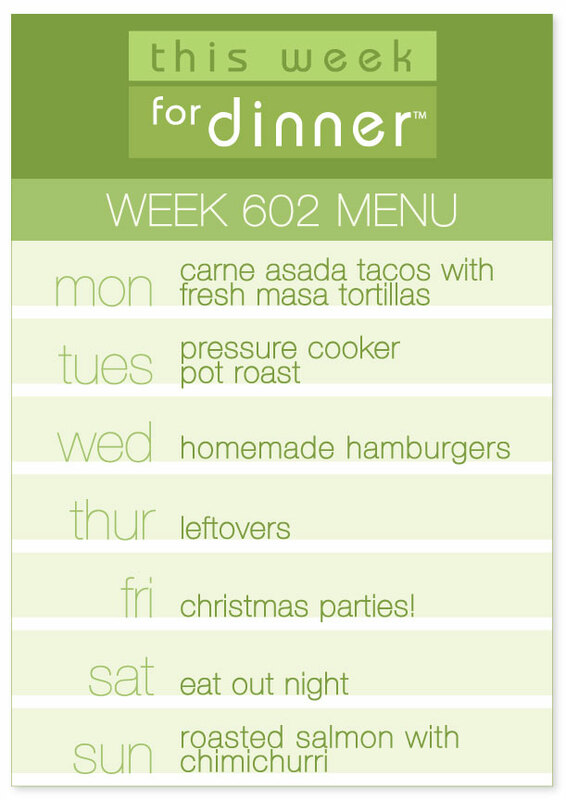 I am buried in work, so getting just now getting my weekly menu pulled together. But here we are, done! Once again the blog forces me to get a little organized, which helps alleviate some of the work stress for sure. Thank you in advance for sharing your own weekly menus in the comments below. I don’t know what I would do without them each week when I sit down to plan! Thank you!